until you have a program that sells like gangbusters. Think about the biggest problem you helped others overcome. Pick one group of people that has that Major Goal or Problem. Get Clear on the Promise Your Program Will Hold (solve 1 major pain or achieve 1 major goal). Pick a name for your product that quickly helps prospects understand the problem/solution it offers. Jot down how your program helps in the following areas: Relationships, Finances, Health, Career, Faith and Mindset, Health and Fitness. Create mouth watering, eye popping, heart pounding marketing material that speaks to the pain of your ideal client. Do this by start writing a friendly letter to an ideal client. Use the words your ideal client would use. Stay away from jargon or industry terms and focus on what they are talking about on chat groups, case studies and client testimonies. Need help? Go to your competitors’ Linkedin profile or client testimonial pages and check out the words they used to describe the problems they had, the solutions they wanted and the results got! Note how your current/past clients talk and use the words they use to describe the problem and the solution. Find JV Partners to help you grow your email list and sell loads more programs. Bonus Step: Create Your Next Program. 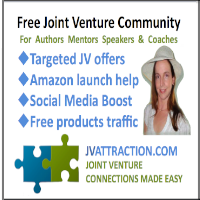 Contact ruth@JVattractions.com for a “Get Your Joint Venture Product Reviewed and Profitable Now” Phone Strategy Session.